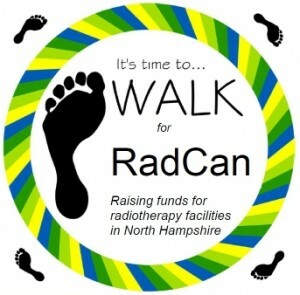 This year’s WALK for RadCan is taking place in The War Memorial Park in Basingstoke, on Sunday May 19th. The event begins at 10:30 am and will be a gentle 5 kilometre walk – once around the park and then on to the new common. There is no minimum sponsorship level, no entry fee, and dogs are welcome. Registration forms are also available at your local Southern Cooperative Stores in Beggarwood, Buckskin, South Ham, Tadley and Overton. The car park is situated at the top of Crossborough Hill. The walk takes place on paths in the War Memorial Park and will start and finish in the main arena. Walkers can sign in from 10.15 to 12.30. The Mayor will officially start the walk at 10.30 am. Medals will be awarded on the completion of the 5k walk. Walkers are asked to wear suitable footwear. St John’s Ambulance will be in attendance . They are situated in the John Arlott Pavillion near the car park. Stewards will be on hand to assist with queries. The toilets are also situated in the John Arlott Pavillion. Dogs are welcome but must be on their lead at all times, and are the responsibility of their owner. Any mess the dog makes must be picked up and put in the bins provided in the park. If you bring a picnic, please dispose of your rubbish in the bins provided or take it home with you.